The Imagine Español authentication process requires a Site Code by default. To simplify this process for students you can create a bookmark for the web app. You can use QR codes to help students quickly log in and start a student session. Students can click on the Scan QR Code button to open the webcam (camera permissions will need to be enabled either before or during the first time the button is pressed) and then hold the QR code on the card to be scanned. 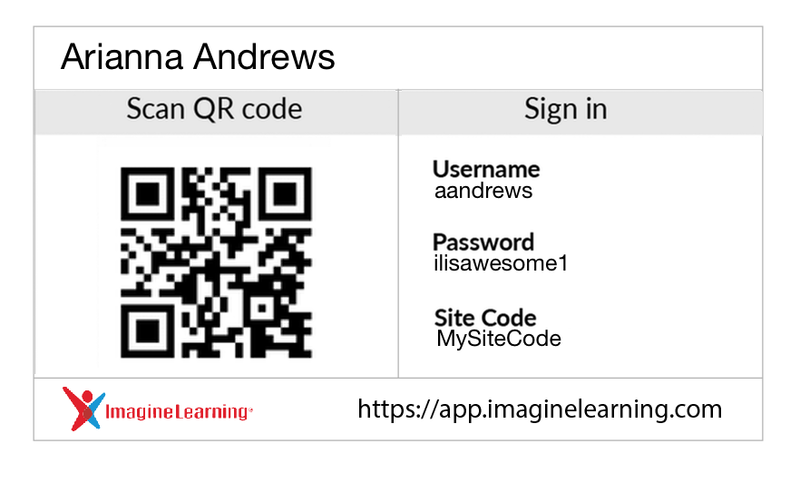 Educators can log into the Portal (my.imaginelearning.com) and generate new login cards. Go to Groups > Select desired group > Select Manage Students > Select students, and click Print Login Cards to print QR codes for students. Is Imagine Learning watching or recording my child? No. The camera is only turned on when the student presses the Scan QR Code button and it shuts off again when the QR code is successfully scanned or the student returns to the regular login screen. Is data with my child's image or likeness sent to Imagine Learning? No. The scanning and processing of the QR code is done locally on the device and no image or video is sent to Imagine Learning for processing or storage. The camera is never turned on or used while a student is logged in and playing activities. Can I prevent the camera from being turned on? Like other apps that use a device's camera, the user must grant permission to use the camera. This typically happens the first time you try it, and then the settings are stored in your device. These settings can, however, be controlled and changed by the administrator of the device (for example, in Chrome you can manage what apps are allowed to use the camera by visiting chrome://settings/content/camera in the URL bar). School administrators can also decide to enable or disable device cameras for the Imagine Learning Student app school-wide as they choose. If I don't have a camera or choose not to grant permission, can my child still log in? Absolutely. Students can still log in by typing their normal username and password. The QR code login experience simply makes logging in easier, especially for younger users who are still learning to type.